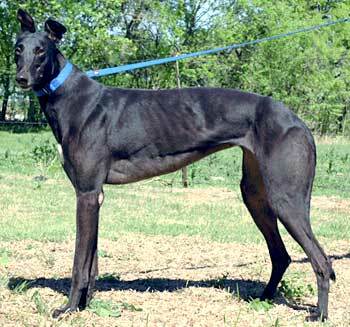 Judy, aka Rossmore Judy, is a petite, 3-year-old black female who celebrates her birthdays on October 5. Born in 2002 to sire, Rapido Rambo, and dam, Oracle Mist, Judy and her sister, Queen, entered the racing circuit in June of 2004 at Connecticut's Shoreline Star Greyhound Park. Adding a few races at Plainfield to their history, the sisters then traveled together to Texas and competed at Corpus Christi and Valley Race Park. 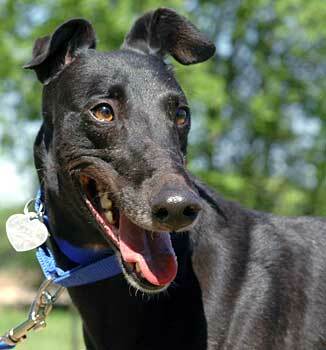 Judy's name is on 100 races, and this little girl is now ready for retirement and the comforts of home. Judy is not cat tolerant but has not been tested with small dogs. Judy is a sweet and petite little girl (about 55 pounds) who is loving the retired life. She is very smart and quickly acclimated to the life of a couch potato. Judy is very content to sleep 23 hours a day on a nice fluffy dog bed. 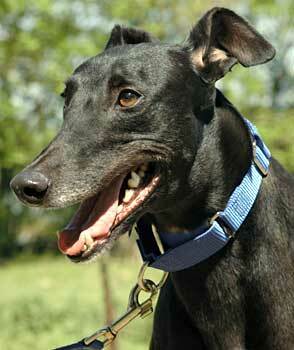 Currently Judy is living in a foster home with three other large male Greyhounds. She gets along well with all large dogs, but has not yet been exposed to small dogs. She seems to really enjoy being around other dogs. In fact, she loves touching the other dogs. Our senior gentleman, Comet, will allow her to lay her head on his chest while he's sleeping. Sometimes you will see Judy walk up to another Greyhound and put her head under his chest, like she is trying to walk under him. Although in the beginning it was felt that Judy was cat tolerant, as she became more comfortable in her new surroundings we found that she is really not cat tolerant. She has a very docile personality and rarely gets herself into any trouble, and is quite submissive around other dogs. Judy is a very well-mannered little girl when it comes to eating. She eats a little slower than the other dogs in the house. She likes to take her time and chew every last bit of food in her bowl. She is also a very dainty drinker and does not splash the water all over the floor when she gets her drinks. Judy is not food aggressive, so you can easily give or take away treats or other things she shouldn't have without any problems. She is also quite dainty in how she takes things from you. My neighbor's two-year-old daughter can easily give her treats without getting her fingers nipped. Judy can be a little shy with new people at first, but quickly warms up and will give you a lot of love and affection. She tends to learn her behaviors from the other Greyhounds so if they want affection she will come to you for affection. And when she is on her own, she is a bit more shy. Judy would probably be fine as an only dog; it just might take her a little while longer to get comfortable to her new home and family without having any doggie pals around to show her the ropes. Judy also really enjoys having a yard. While all Greyhounds should be indoor dogs, and most Greyhounds can only stand being outside for short periods of time (mine can only take 5-10 minutes outside during the summer heat! ), Judy really enjoys a good sunbathing!! She will lay out in the direct sunlight for a good 30-40 minutes. She loves to sit with the wind flapping her ears and loves it when I turn the hose on the mist setting to cool her off. Judy would be extremely happy if her new adoptive family had a yard, if even only a small patch of grass where she can lay and get some fresh air. As for the finer details -- Judy is housetrained. She normally won't give you any signals when she needs to go out, so we just let her out often since we don't have a doggy door. She is very well behaved and does not beg for food, and she does not get on any furniture other than her dog beds. Judy walks extremely well on a leash by herself as well as with other dogs. She does not pull or cross in front of you while walking, unless she sees a rabbit! She is crate trained, although she is not fond of it. She loves any and all treats you will give her (but has still managed to keep her girlish figure) and she will take them from you very gently. She rides in a car perfectly!!! She sometimes thinks she can't jump into a tall SUV and will wait for you to lift her into the back of the car. What a little lady. She likes soft, fluffy, squeaky toys and will sometimes take them outside to sunbathe with her. She does fine being home alone all day in a crate or out in the house on a dog bed. If you work really long hours, I suggest crating her while you are gone. Judy rarely barks, and if she talks at all it's usually just a little high pitch whine to let you know she is excited about something she sees - like a rabbit! If you are looking for a sweet little girl, who is calm and loving and affectionate, then Judy may be the dog for you! !